Microsoft just released a new chat-based workspace in Office 365. Microsoft released Teams to help your team to communicate more effectively. This time the team collaboration will happen through a chat-based collaboration tool from Office 365 known as Microsoft Teams. Microsoft Teams offers a dedicated hub for teamwork and provides easy access to the information, tools, and content that teams need. This is the new chat conversation experience for today’s team where Skype is tightly integrated so that teams can do voice and video conferences. Also, people can use emojis, stickers, GIFs etc. These conversations are by default public which will be visible to everyone in the team, but there is an option to make conversation private too. All Office 365 products like Word, Excel, PowerPoint, SharePoint, OneNote, Planner, Power BI and Delve are all built into Microsoft Teams so that people will have all the information and tools which they need. Microsoft Teams is also built on Office 365 Groups. Microsoft Graph, intelligent services are surfaced throughout the workspace to help with information relevancy, discovery, and sharing. All these make Microsoft Teams a true hub for teamwork. People can customize their own workspace because each team is unique. Microsoft Teams also provides notifications and updates from third-party services like Twitter or GitHub. Also, developers can extend Microsoft Teams through Microsoft Teams Developer Preview program. Security wise Microsoft Teams provides the advanced security and compliance capabilities, Data is encrypted in transit and at rest. Microsoft Teams will support key compliance standards including EU Model Clauses, ISO 27001, SOC 2, HIPAA and more. How to turn on Microsoft Teams? We can turn on Microsoft Teams from Office 365 admin center. 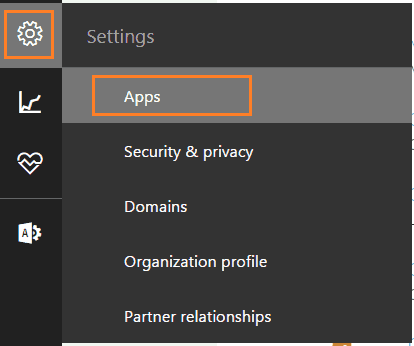 Login to Office 365 Admin Center and then click on Settings icon -> Apps. The settings will be saved and Microsoft Teams will be available to use.